Check out my first homemade palette! Ignore the 3 on the right, I totally cheated and shoved 3 MAC pans in there for the photo whilst my last 3 pigments were drying. 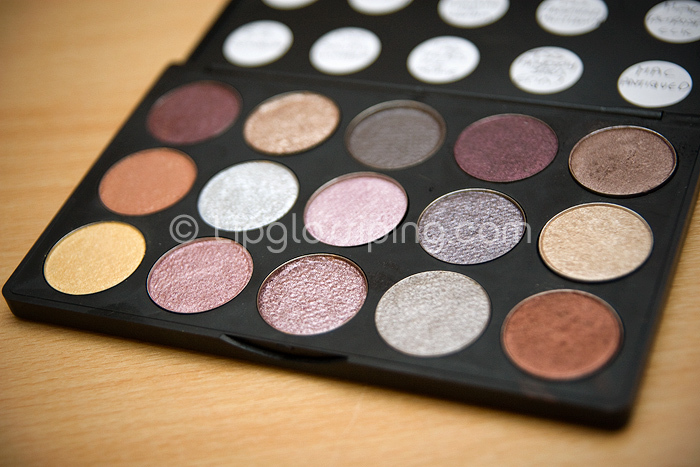 The palette is mostly made up from The She Space pigments, I find that one full size pigment fills a pan fairly nicely. I’ve also sneaked in a BarryM Dazzle Dust and a few Elemental Beauty shadows too! What ya reckon? Any of you ladies press your own loose eye shadows? Any interest in a pictorial on my pigment pressing methods? Very impressive, the gold one in the middle at the bottom, looks very professional. I am joining the throngs of those who are eager to learn how this was done – please tell us your secrets! I’d love to know where you bought the palette and pans from etc. Yes please! I’d really like to press some of my loose shadow. I’d love to know everything about pressing pigments as I havew about 20 pigments, but hardly ever get around to using them. Also what do you need, where did you buy all the stuff you need, etc., etc. Wow, it looks really professional! Well done! I keep meaning to press pigments but never get around to it. good idea. very nice. so yeah if you can do share process from loose to pressed!! I’ve been considering pressing my Barry M dazzle dusts recently, so would love to see how you did it/where you got your supplies from! I would love to learn about your pigment pressing methods. I don’t like loose powders because I tend to spill them all over the place. OK OK – how on earth did you get Dazzle Dusts to press? I’ve tried pressing mine but they just don’t stick together. Tell me (and everyone else) your secrets. Woo hoo, That’s awesome I love all the colors. That palette is like something I would totally make for myself. Very nicely done. Mine always comes out so amateurish. Tutorial please! That PALETTE looks awesome! I made my first MAC palette last year and I Love it! 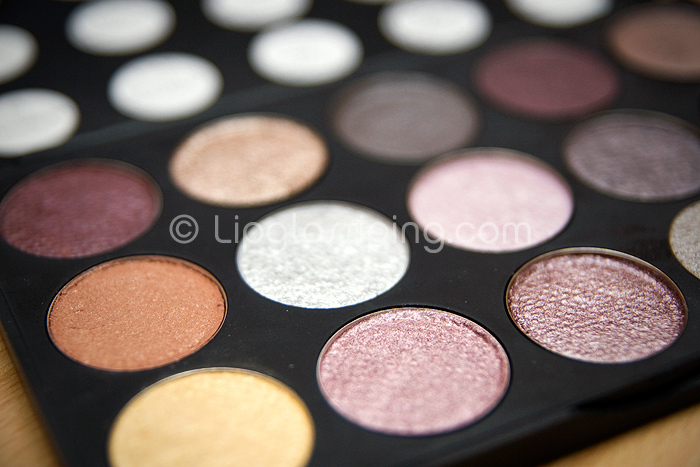 BTW, any chance there are Bohemian Palette’s at your local Superdrug. Mine keep running out here in Poole. LMK and maybe I can pay you for them!! awesome D.I.Y. idea… I would have thought this was all MAC e/s because it’s so neat and very impressive. I have done this method to some of my pigments but they never come out this neat. Just wondering if you used alcohol or a mineral makeup pressing medium? yes, definitely interested in your pigment pressing method!